Weighing in at about half the weight of a 400mm f/2.8 lens, the Canon EF 400mm f/4 DO IS II USM Lens immediately finds favor with sports and wildlife photographers looking for an easily hand-holdable, high-performance lens. This lens is positioned to be the ultimate lightweight, hand-holdable sports and wildlife lens and is one of the overall best-performing lenses available. The 400 DO II was designed for those who are serious about what they are photographing and is priced accordingly. As denoted by the "II" in the product name, there was indeed a prior version of this lens. As with the previous lens, the "DO" stands for Diffractive Optics. Newly developed gapless dual-layered diffractive optical elements to be more specific. Diffractive optics are responsible for keeping the size and weight of a lens with a long 400mm focal length and an f/4 max aperture very small and extremely light. 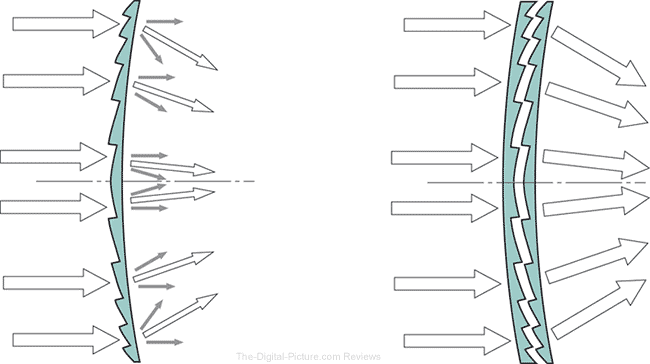 Here is a Canon illustration showing a cross-section of diffractive elements and arrows showing how they work (note that this is a pre-version II illustration). "A single diffraction grating (left) creates a lot of superfluous light which degrades the final image. By combining two gratings (right), Canon has overcome this problem." [Canon] As viewed from the front, the diffraction grating forms concentric circles. 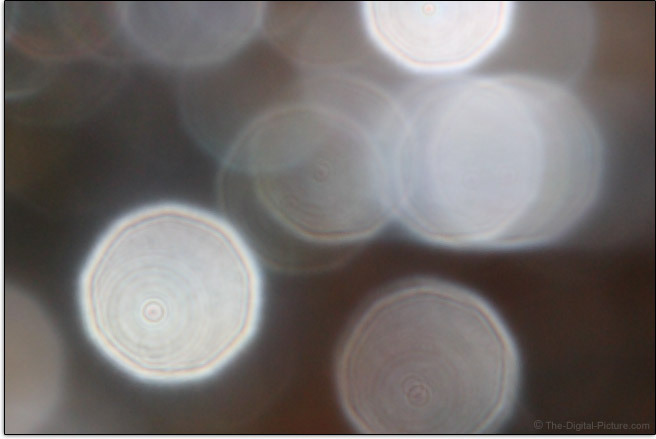 Looking into the lens at just the right conditions, these concentric circles can be seen. Per Canon, "The EF400mm f/4 DO IS II USM is the first lens to offer a third-generation DO lens gapless dual-layered diffractive optical element. This new lens element structure prevents any decline in diffraction efficiency caused by the air layer used in previous designs. By making the two diffractive lattices adhere to each other, this removes the air gap, which could result in internal lens flare and the appearance in direct light of rings in images from the diffraction gratings on the lens elements." I loved everything about the first version of this lens, with a major exception being the image quality it delivered and low contrast was my primary image quality concern. Yes, for the price of this lens, that was a very serious exception. For me, "DO" meant "low contrast" and I preferred to use the slightly-heavier 300mm f/2.8 with a 1.4x extender behind it when I needed a 400mm lens smaller and lighter than the f/2.8 version. I am happy to report that the contrast issue has been resolved in version "II" and I'm trying to justify the addition of this lens to my personal kit. While there are other uses for a 400mm focal length, sports and wildlife photographers will be among the primary users of this lens. 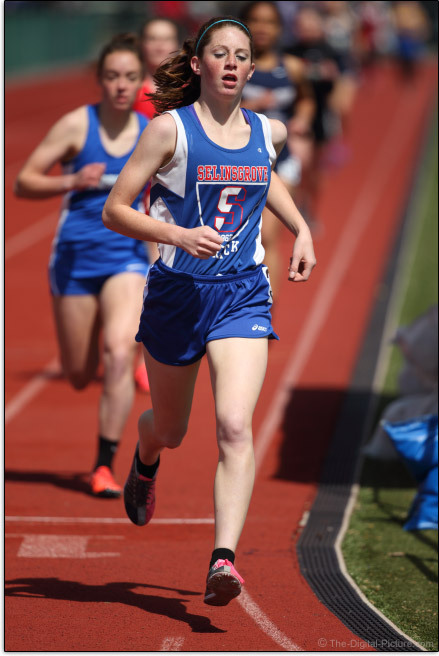 My 400 DO II Lens arrived in the heart of my spring sports season and this lens covered all of my events during the three weeks or so I evaluated the lens (except for two where I needed a 600mm f/4 Lens). Photojournalists are another group that will be found with this lens in their kits. Some landscape photographers, especially those carrying lenses for long distances, will appreciate a 400 DO II in their packs. Telephoto-captured landscapes show a compressed view of the scene and the narrow angle of view is often easy to create compelling compositions with. If an indoor or outdoor event such as a dinner, speaker, choral concert, wedding, etc. has decent lighting, this lens works very well for capturing moderately-tightly-framed images of not-in-fast-motion guests/speakers/performers. With an APS-C/1.6x FOVCF sensor format DSLR mounted behind this lens, the full frame equivalent angle of view becomes 640mm. At this focal length, wildlife (especially including birds and small animals) and big field/dangerous/distant sports become an even more-primary target. 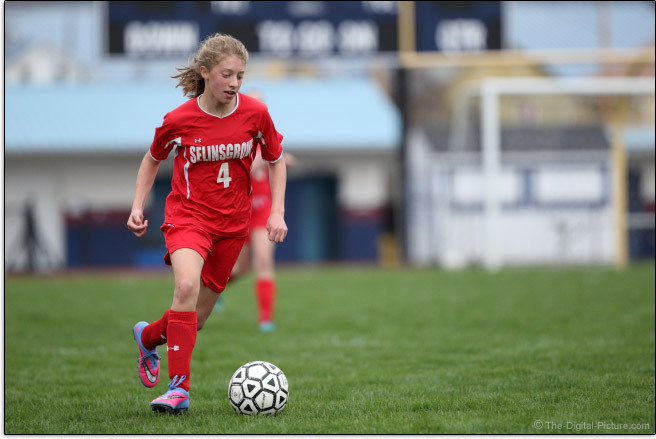 Here is one reason why I prefer long focal lengths when using prime lenses for sports: When shooting fast action with a prime lens, there is often inadequate time to adjust one's shooting position for optimal framing and cropping is often required for optimal final framing. The longer the focal length being used, the more distance the subject can range over while remaining in or near the ideal (or near-ideal) framing distance. The narrower angle of view provides a longer duration in which to capture an optimally-framed subject, which can result fewer images requiring cropping. This saves time (and increases final resolution). 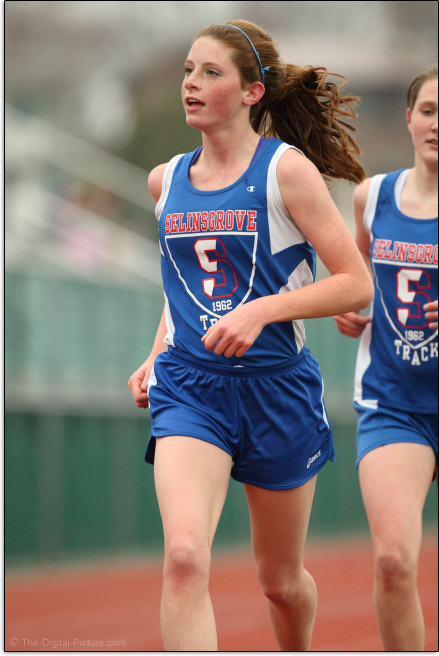 For example, if you are photographing a running person with a 24mm lens on a full frame format DSLR, optimal framing distance to capture the entire person might be 9' (3m). At 18' (6m), that person would only be 1/2 of optimal size in the frame. A person running at full speed will only momentarily be near that optimal distance. In contrast, a 400mm lens would frame this person similarly-optimally at around 135' (42m) with the 1/2 optimal distance being 270'. It takes a running person far more time to cover this 135' (42m) 1/2 optimal to optimal distance than the 24mm lens' 9' (3m) distance. Distances much closer than optimal will often result in the subject being cropped in the frame, so I discount the advantage of the longer focal length on a too-close subject. The greater amount of time the subject remains at near-optimal framing distance, the more time you have to capture ideally framed shots - and you can cover a much greater area of the event from a single position. This does not mean that a 400mm lens is always a better choice. A longer focal length lens requires you to be farther from the subject than a wider angle of view lens and the longer distance makes obstructions a greater possibility. The subject distance availability is not always flexible, so 400mm is not universally the best choice. But, 400mm is definitely the answer for many sporting events and in front of an APS-C format sensor, the 640mm-equivalent angle of view is perfect for large field sports. 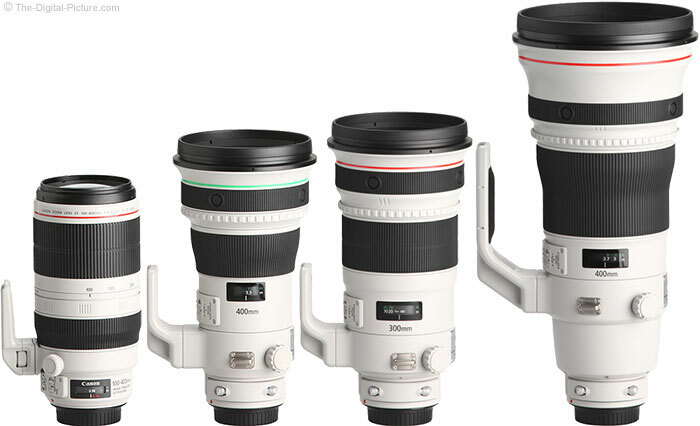 Canon currently offers three 400mm prime lenses in its lineup. All perform superbly, but they vary dramatically in size, weight and price depending on the max aperture they offer. 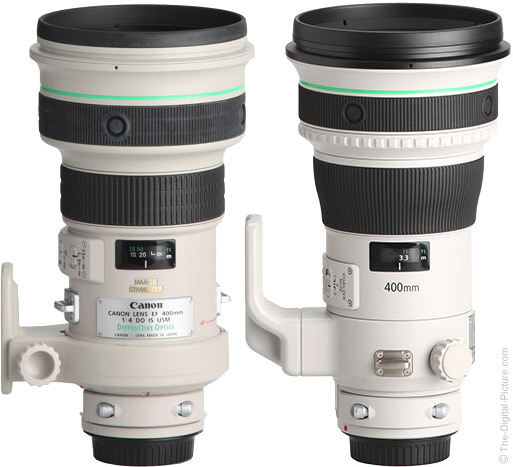 The Canon EF 400mm f/4 DO IS II USM Lens is sandwiched between the wide aperture f/2.8L IS II and the narrow aperture (and image-stabilization-lacking) f/5.6 L. The 1 stop max aperture difference between these lenses represents a 1/2x or 2x difference in the amount of light provided to the imaging sensor when the lens is used at max aperture. Wider aperture lenses have the capability of creating a stronger background blur and typically show less vignetting when stopped down to the max aperture of the other lenses. Lenses with an f/2.8 or wider aperture will enable the enhanced center AF point accuracy on many DSLR cameras. The downsides to the wider aperture are size, weight and price. As I'll focus on later in the review, the 400mm f/2.8 lens has an especially large size and weight penalty over the f/4 DO II. If shooting fast action under the lights, on a very cloudy day or after the sun sets, I generally find f/4 to be at least somewhat lacking in its ability to allow the camera to stop action without resorting to a noisy ultra-high ISO setting and much prefer to have the f/2.8 version in front of my camera. I shot a couple of late afternoon/early evening sporting events on very cloudy days and the ISO necessary for fast-action-stopping shutter speeds was in the 2000-4000 range. The example immediately above was captured nearly 2 hours before sunset on a cloudy day with ISO 4000 required for a 1/1600 shutter speed. While ISO 4000 is rather clean on the 1D X I was using, I prefer to use the lowest ISO setting possible for ideal image quality. If the light is reasonable, f/4 is usable for even very fast action. By "fast action", I am referring to the rate that subject details cross over sensor pixels during an exposure since that is what causes blur. The more pixels crossed, the more blur that shows in an image. A motion happening very close to the camera is going to show blur more easily than the same motion occurring far from the camera with the same focal length in use. Under bright daylight, a 1/1600 shutter speed can be obtained at f/4 and approximately ISO 100 or 200. And if your subjects are not moving (or not moving much), image stabilization makes this lens very usable handheld even in very low light conditions. An f/4 aperture proved good enough for use at a chorale event hosted at a local school auditorium with reasonably bright lighting. I used the 400 DO II for 99% of the images captured during this region group's performance with an ISO 1600 setting being adequate for most images. My assignment for this event was rather vague, but I knew that the marketing agency supporting the organization preferred tightly-framed images of the performers. I also know that a photographer's role is, as much as possible, to stay unnoticed during such performances. The 400mm focal length allowed me to stay relatively hidden in the aisles with no camera support needed for accomplishing the task I was assigned. A lens specially designed to be very small and light invites handholding and handholding a telephoto lens is greatly aided by image stabilization. The Canon EF 400mm f/4 DO IS II USM Lens is equipped with a best-available-at-review-time 4-stop-rated image stabilizer system. Your choice of three IS modes is available. Mode 1 is for stationary subjects. Not only does IS help deliver a sharper image, but you will also find the Mode 1 stabilized viewfinder extremely helpful for obtaining ideal subject framing while handholding this lens. A stabilized image also aids auto focus accuracy. Canon's newest IS mode, found currently on only super telephoto lenses, is the designed-for-tracking-action Mode 3 IS. In Mode 3, image stabilization is active and ready for use the moment the shutter releases, but actual stabilization is not in effect until that precise time. The view seen through the viewfinder is not stabilized, and you are able to follow your erratically moving subjects without fighting against image stabilization designed to prevent you from doing the same. IS Mode 3 is designed to detect panning motion and, when detected, will only apply Image Stabilization at right angles to the direction of the detected movement (like IS Mode 2). 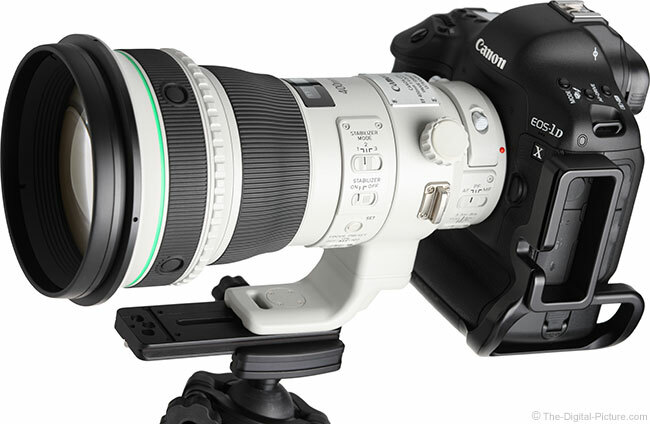 Mode 3 IS debuted with the Canon 300mm and 400mm f/2.8L IS II Lenses. I gave Mode 3 a significant amount of workout with those lenses and subsequently made Mode 3 my standard action photography IS mode setting. IS turned off was my previous choice – I usually need a shutter speed adequately fast for handholding to stop the action I am shooting. But, I did sometimes see benefits to using IS Mode 3 for action. Mode 3 on the 500 and 600L IS II lenses also worked well for me, the 200-400's IS Mode 3 is performing similarly and I now add the 400 DO II to this group. I have been shooting action in Mode 3 100% of the time. You will hear some light clicking and whirring while IS is active on this lens with startup and shutdown clicks being more easily audible. I don't think anyone noticed even the startup/shutdown sounds in the quiet chorale environment I photographed in. Your shutter release will likely be more noticeable in quiet scenarios, though the 5D III and similar cameras are not much louder when used in their silent modes. If recording sound in-camera, you will likely capture IS noise from this lens. As with similar Canon IS systems, the 400 DO II's IS system is very well implemented. By this I mean that, in part, the image in the viewfinder does not jump when the system activates or during subject framing adjustment. How well the IS system reduces camera shake is of course the most important attribute of an IS system and the DO II's IS system performs incredibly well in this regard. I found capturing sharp handheld images while depending on the rated 4-stops of assistance to be easy. Five stops of assistance was not difficult to reach. Indoors (no wind) with stable footing and good technique, I was getting 5 at-least usably sharp images out of every 6 captured completely handheld (no assistance from elbows resting against body) at 1/8 second. Below 1/6 second exposures, the keeper rate dropped very rapidly. This is very impressive performance and makes an ultra-light lens even more usable handheld. As I said at the beginning of this review, I am not a fan of the original 400 DO's image quality. I have owned three different copies of the version 1 lens (manufactured over a wide range of years) and found none of them to be very exciting in this regard. I found the far-less-expensive Canon EF 400mm f/5.6L USM Lens to be sharper at f/5.6 (comparison). No, the 400 f/5.6L does not have an f/4 aperture available nor does it have IS, but it is smaller, lighter and far less expensive. Clear to me was that the new 400 DO II was going to be an impressive performer optically, very "clearly" better than the version I lens. According to these charts, the DO II is nearly equivalent to some of Canon's optically-best-ever lenses including the Canon EF 300mm f/2.8L IS II USM Lens. I couldn't wait to see the lab test results for this lens. Unfortunately, my wait to get this lens in my hands was considerably longer than expected. A handful of lenses initially hit the market, but mine was not one of them. Nothing showed up on my radar for four months until Canon USA was finally able to source a review lens for me with a second retail copy arriving a couple of weeks later. With the lens in house, it went straight to the lab for testing on the unforgiving enhanced ISO 12233 resolution test chart (after a brief stop for product images). The results for this lens were easy to read and you are going to like what you see. From a wide open f/4 aperture until diffraction begins to show softening effects, this lens delivers impressive sharpness across the entire full frame image circle. The image corners from the retail lens are amazing from f/4. On the Canon USA-supplied lens, corners sharpen slightly at f/5.6, but much of the visual improvement comes from a reduction in peripheral shading. Any differences in sharpness at f/8 are negligible and the effects of diffraction are becoming visible at f/11 on 20+ MP full frame DSLRs. Using the site's image quality tools, let's look at some comparisons. First up is the Canon 400mm DO IS II compared to the 400mm DO IS (version I) Note the significant contrast improvement over the original 400 DO. The blacks are obviously darker. The difference in sharpness remains clear even at f/5.6. The II's reduction in CA is also worth mentioning as is the with-extender performance. Next up is the Canon 400mm DO IS II comparison to the 400mm f/2.8L IS II. Both lenses in this comparison are initially set to wide open apertures. Finding differences here will challenge good eyes, and keeping perspective, we are comparing the DO II to one of the most amazing lenses available. At f/4, the f/2.8 L IS II, assisted by some vignetting clearing, shows a slight advantage. Best wishes on finding a sharpness difference at f/5.6. Finding the difference size, weight and price is much easier. Canon's biggest zoom lens, the 200-400 f/4L IS, should be considered by those looking for 400mm coverage at the same f/4 max aperture. In the Canon 400mm DO IS II vs. 200-400mm L IS Lens comparison, we see the results of two very impressive lenses with the comparison being essentially an exact match. Another way to get an approximately 400mm lens with an f/4 max aperture is to mount a 1.4x extender behind the 300mm f/2.8L IS II Lens. The Canon 400mm DO IS II vs. 300mm f/2.8 L IS II Lens with 1.4x comparison again shows two very impressive lenses, this time with the 400 DO II performing very slightly better. 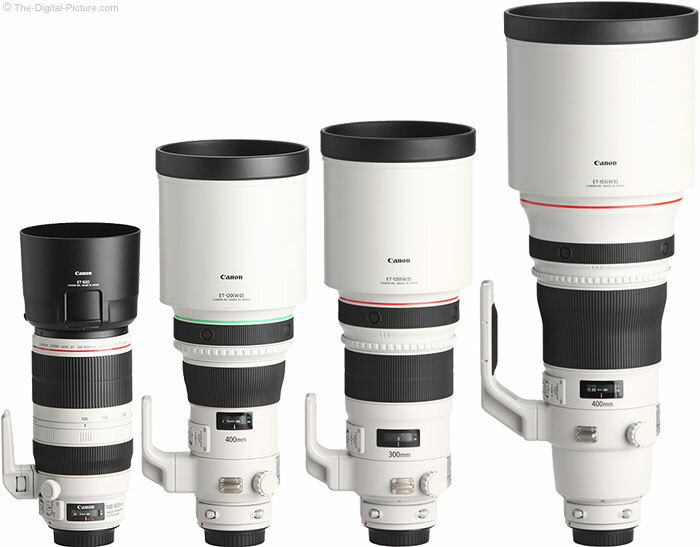 The Canon 400mm DO IS II compared to the 400mm f/5.6L is another relevant consideration. There is not much difference to talk about in the wide open comparison between these two lenses. At f/5.6, the 400 DO II takes a slight advantage. The DO II has slightly less CA. Another amazing lens to recently hit Canon's lineup is the 100-400 L II. Here is the Canon 400mm DO IS II vs. 100-400mm f/4.5-5.6L IS II Lens comparison at 400mm. Especially for a zoom lens, the 100-400 L II performs remarkably well. The DO II has less distortion and slightly less CA, but in terms of sharpness difference, there is not much to discuss. If I look really hard, I'd give the edge to the DO II at f/5.6, but the vignetting clearing is the biggest sharpness/contrast difference. While the two f/5.6 max aperture lenses perform exceedingly well, we cannot forget the 1 stop difference in max aperture. That 2x difference in light means a lot in some circumstances. I mentioned vignetting and, like nearly all other lenses, the 400 DO II has some. However, the about-1-stop of peripheral shading with a wide open aperture bests most other lenses tested at their wide open apertures and this amount is barely noticeable in most images. APS-C users have nothing to worry about. Canon indicates that "The DO element in the new lens is optimally positioned deeper within the optical formula than in the original EF 400mm DO lens to help reduce flare around backlit subjects." Also, "Canon's original SWC (Sub Wavelength Structure) lens coating is also used internally to help improve resistance to flare." The site's standard sun in the corner of the frame flare test is brutal on long focal length lenses (400mm is the max focal length tested in this manner), but in actual use, I'm not finding any flare issues from this lens. Bright lights in the frame have not been a problem. Let the straight lines fall next to the edges of the DO II's frame because this lens will keep those lines straight. Distortion is negligible. The DO II has a nine blade curved diaphragm. The 400 DO II's front and rear lens elements have received Canon's fluorine coating treatment, repelling dust and making cleaning very easy. All of Canon's super telephoto lenses to date have turned in best-in-class auto focus performance and, with the latest-available CPU installed and the latest AF algorithms applied, this lens performs (at least) similarly. The Canon EF 400mm f/4 DO IS II USM Lens, like all of Canon's other big white lenses, features Ring USM (Ultrasonic Motor) driven AF and focuses extremely fast. The fast focusing is accomplished quietly with only some quiet shuffling movement heard inside the lens during AF (if you listen very carefully in a quiet venue). The 400 DO II (and every other current Canon super telephoto lens) focuses internally and supports FTM (Full Time Manual) focusing. These lenses also include a Focus Preset feature. Set the Focus Preset to a specific distance and when your shooting needs require that specific distance, simply turn the white spring-loaded knurled playback ring near the end of the lens. The Focus Preset switch settings include an optional audible focus confirmation setting. The Canon EF 400mm f/4 DO IS II USM Lens' manual focus ring is very nicely-sized, is easy to locate and is properly damped. With a 233° angle of rotation and a wide diameter, this ring has a very nice to slightly fast rate of adjustment and is very smooth with no play. Subjects change size somewhat as they go into and out of focus, but mostly they rapidly become very blurred as they leave focus. New on the 2010-and-later-announced super telephoto lenses is the third focusing mode: "PF" or Power Focusing. Turn the ring slightly to get the low speed electronically-driven AF and turn it to a greater degree to obtain the higher speed. The direction of ring rotation determines the direction of focus distance change. This feature works. Some skill is required to stop focusing at a precise location in the fast speed. You are going to need a solid tripod setup and a steady hand to not induce movement while turning the ring during video recording. The electronic focusing is very quiet. A 3-position focus limiter switch allows focusing distances to be limited to a specific distance range – or to be unlimited: 10.8' - 26.2' (3.3m - 8m), 26.2' - 8 (8m - 8) and 10.8' - 8 (3.3m - 8). Limiting the focus distance range can improve focus lock times and reduce focus hunting. Autofocus Stop buttons near the objective lens allow autofocus to be temporarily stopped. I use AI-Servo focusing mode for shooting sports, but like to shoot a focus-and-recompose portrait at times during the event. The Autofocus Stop feature makes it easy to obtain focus lock, turn off autofocus and recompose for a framing that places the active focus point(s) off of the subject. As always, the greatest image quality will quickly be negated by focusing errors. AF accuracy is extremely important for a lens such as the 400 DO II to be successful - especially AI Servo AF accuracy. With the shallow DOF (Depth of Field) possible with this lens, even small focusing errors can ruin the shot. As I mentioned, Canon's super telephoto lenses historically have delivered best-available auto focus performance, I expected nothing less from this lens and it delivered. This is one of the most accurate focusing lenses I've used and that includes challenging AI Servo AF scenarios. As I mentioned at the beginning of the review, I have been using this lens to cover my spring sporting events with my 400 DO II frame count at roughly 10,000. While the 400mm f/4 DOF is greater than 400mm f/2.8 (lightening the AF challenge somewhat), this lens has delivered a keeper rate at least as good as any other lens I've used including the 400mm f/2.8 L IS II. An area where Canon's super telephoto lenses have not delivered best-available focusing performance has been in their MFD (Minimum Focusing Distance) and the related MM (Maximum Magnification). Some version II super telephoto lenses show some improvement, but the 400 DO II only improves from 0.12x to 0.13x. Improvement is always welcomed, but ... a 0.13x MM spec is not a strong advantage held by this lens. We figured out what was eating the flowers. 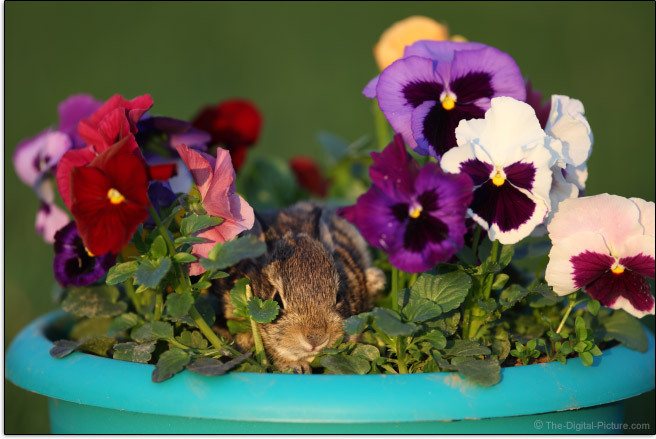 This baby cottontail rabbit in the pot of flowers was captured at the 400 DO II's MFD. Note the nice background blur this lens can produce at this focus distance. Here is a comparative look at the close focusing capabilities of some similar lenses. For many more comparisons, review the complete Canon EF 400mm f/4 DO IS II USM Lens Specifications using the site's Lens Spec tool. Extension tubes can be used to reduce the focus distance a lens is capable of and extension tubes will be a desired part of many 400 DO II kits. Using the Canon EF 12mm Extension Tube II provides a magnification range of 0.17-0.03x and use of the Canon EF 25mm Extension Tube II results in a 0.22-0.07x range. I use extension tubes more with super telephoto lenses than with any other lens type. The reduction in minimum focusing distance can be especially helpful with these lenses when photographing wildlife at close distances (primarily small-sized wildlife including birds). The loss of infinity focus is a downside to using extension tubes. All Canon super telephoto lenses are also compatible with the Canon Extender EF 1.4x III and the Canon Extender EF 2x III. The resulting lens combinations are impressive. Use of the 1.4x creates a still tiny and ultralight 560mm f/5.6 IS and use of the 2x creates a similarly-sized 800mm f/8.0 IS lens. Note that an f/8 max aperture lens plus extender combo will only autofocus using native through-the-viewfinder phase detection AF when mounted to 1-Series and select other EOS cameras including the 5D Mark III and the 7D Mark II. These very high focal length numbers require little change in physical size or weight to be achieved, furthering the value of this lens – especially for wildlife photography. Image quality impact from the 1.4x magnification is very minimal with a more noticeable (but still not bad) hit taken with the 2x. With-extender image quality is slightly improved by stopping down 1 stop. AF speed with even the 2x mounted behind the DO II remains quite good with decent contrast available. Note that Canon Europe CPN has stated "To get the best out of the new lenses and the Mark III extenders photographers must ensure they attach the extender to the lens first, before attaching the whole unit to the camera. This ensures that the combined lens information is transmitted correctly to provide the optimum image quality and focus performance." I always mount my extenders to the lens first – even before hearing this advice – just because it (apparently) is what comes natural for me. This is not an L Series Lens and neither was the original 400 DO. Apparently, "DO" and "L" are mutually exclusive at this point in Canon lens product development, but more important is that DO is essentially L in terms of quality. Aside from the red ring being replaced with a green one, I don't see a difference in build quality. The 400 DO II is built superbly, ready for the rigors of professional outdoor use. This is a fixed-size lens with the focus ring, power focus ring, switches/buttons and tripod ring being the only moving exterior parts. Robust, lightweight magnesium alloy and titanium are the primary materials used for lens barrel components, giving this lens both a solid feel and a durability expected from such a lens. The overall smooth design of this lens both looks and feels great. Like Canon's other big white lenses, this one has plenty of buttons and switches available. Their functions have already been discussed in at least some detail. Ideal for a lens that is going to be primarily used outdoors is that this model is weather sealed. This does not mean that you can submerge the lens, but that it is designed to take some dust and moisture without issue. No front filter is required for complete sealing on this model. As photographers, we are very visual and a visual size comparison is always revealing to me. So, let's place a small selection of the above lenses side-by-side. The difference in size between the f/4 DO II and the 400mm f/2.8L IS II is striking. The weight difference feels even bigger. Since the second half of 2010, Canon has been using a new whiter white color for their lenses and the DO II gets the new color. The difference is readily visible in a side-by-side comparison. Although the new lens is similar in size to the older model, many design refinements can be seen in this visual comparison. A nicer contour to the lens shape and a recessed switch bank are two changes. 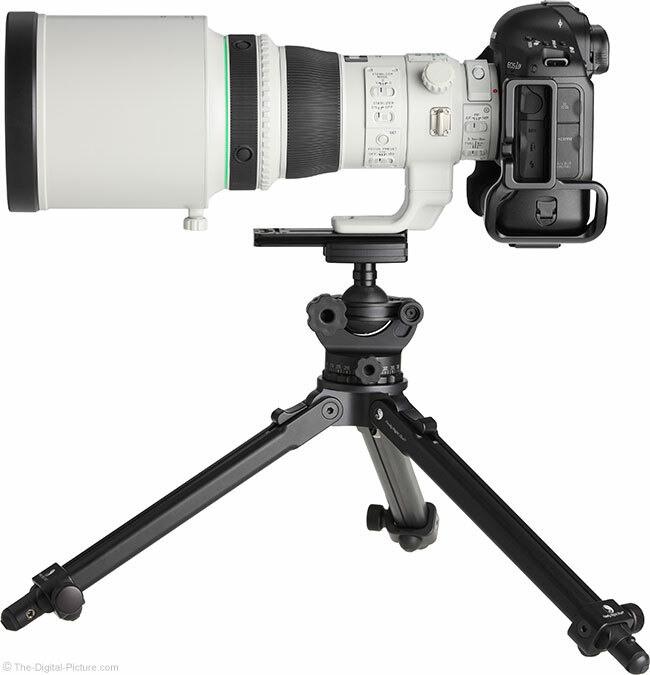 The tripod ring and foot receive very significant upgrades including substantial size increases. The ring is better recessed into the lens barrel (which is now larger in diameter in this area) and the lock knob is in a better position for use. The 400 DO II's tripod ring is very solid and very smooth with four detents making precise 90 degree rotations easy. This ring is not removable (the DO I's was). I seldom remove tripod rings, so ... I'd usually prefer they be unremovable. With a single 1/4"-20 threaded insert available, an anti-rotation feature is a requirement for a lens plate used on this lens. The Wimberley P30 shown in some of the product images on this page meets that requirement and also creates a nice handle for carrying the lens. The 400 DO II tripod ring has a slot for a Kensington-type wire security lock located under the flip-open cover on the tripod ring knob. 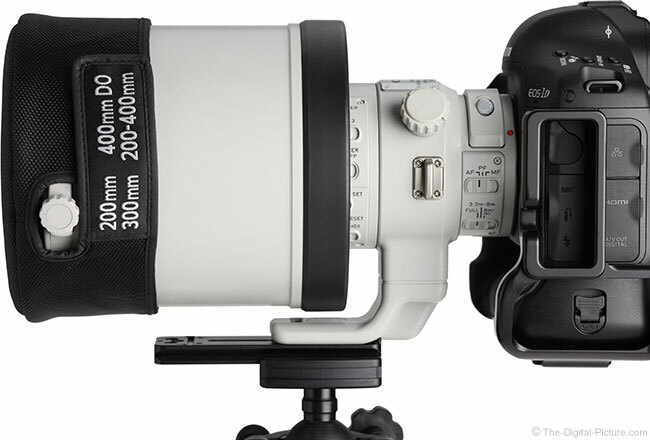 The Canon EF 300mm f/2.8L IS II USM Lens and 400 DO II share the Canon ET-120W II Lens Hood model. The lightweight ET-120W II hood very substantially increases the size of this lens, but I highly recommended it be used for both front element protection and for protection from potentially flare-causing light. Take care against losing or damaging the hood as the replacement cost is over $500. As we have seen with the other Canon big lens upgrades is the 400 DO II's new lens cap. The new design is a huge improvement from the prior caps. Canon's previous model super telephoto lenses came with a large leather-like lens cap that completely covered the reversed lens hood and was held in place with a drawstring. The drawstring was not needed as these covers were difficult to get off. The entire lens hood is no longer covered, but the padded nylon cover can easily be removed with one hand – simply pull the Velcro-attached tab. While the cap is designed to be installed on the reversed lens hood, I sometimes use it over the installed lens hood. The fit is not optimal, but it is functional. The cap can also be attached with the hood removed if you pull the tab tight enough, but the fit is not very good. The lens cap has a padded-but-hard back to protect the front lens element. Multiple lens models now share this cap as indicated by the embroidery on the cap itself. 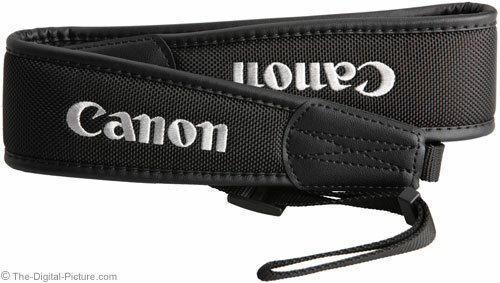 Also shared with the 300L IS II is the Canon Lens Wide Strap B. The lens strap now attaches to the tripod ring instead of the lens barrel in front of the tripod ring. This new position allows the camera to be rotated without the neck strap following the rotation (and potentially twisting around your neck). Not shared, but very similar to that included with the 300 IS II, is the dedicated/included Canon Lens Case 400D. 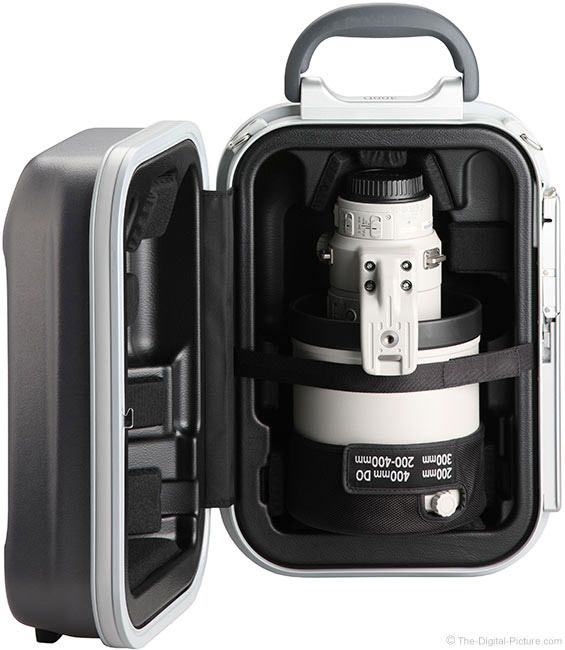 Canon super telephoto lenses come in a nice, very protective, lockable (keys included) lens trunk. The IS II cases are redesigned with a nice, more-modern appearance. Here is the included Canon Hard Case 400D. This is one of Canon's smaller hard cases, measuring 10 x 10.5 x 15.5" (254 x 267 x 394mm)(DxHxW) and weighing 5.3 lbs (2.4kg). The current-standard Canon long lens hard cases feature two side-mounted carry handles and feet on three sides of the cases including those opposite of the carry handles. Missing to me is the handle that lifts the case straight up from the most-flat storage position (the previous hard cases had this handle). Same-sized Canon hard cases will stack – but new models do not stack with old models. 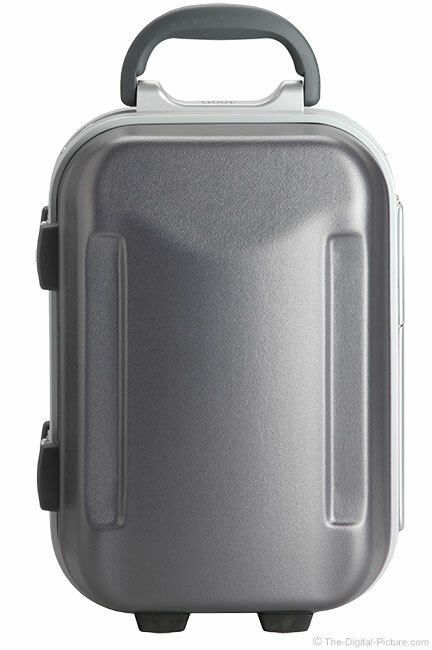 The 400D case comes with a removable shoulder strap as seen below. Canon's hard cases are nice for storage and they are very protective, but I find some of the nicer soft cases to be my preference for transport and use. Like most of Canon's super telephoto lenses, the 400 DO II utilizes 52mm drop-in filters. The two silver buttons near the lens mount are pinched to release the cover and the filter holder under it. Included is a drop-in gel filter holder with a glass filter installed. Helpful is that this glass filter catches dust before it drops deep inside the lens. The drop-in filter that I most frequently use is the Canon 52mm Drop In Circular Polarizer Filter. If you intend to do any landscape photography with this lens, the drop-in CPOL filter is a must-have. Price is unquestionably the biggest barrier to ownership of the Canon EF 400mm f/4 DO IS II USM Lens. This lens is very expensive, but consideration must be made for the general ability of Canon's big white lenses to hold their resale value. Quality Canon lenses taken care of retain their value very well, making my total cost of ownership very low. We all value our lenses and money differently, but ... I think that this lens is worth the price to serious photographers needing portability in a relatively wide aperture 400mm lens. If the price makes the Canon EF 400mm f/4 DO IS II USM Lens unobtainable for you, consider renting one for your special events or travels. Canon USA provided the first evaluation lens for this review. Unfortunately, I have to return that lens. The second lens was retail-sourced and looks forward to living the exciting rental life. There is no shortage of telephoto lens options on the market today – even within the Canon lineup – including a couple of models with zoom capabilities. I will not touch on all possible comparisons here, but I will include some alternatives that I find interesting. Also, since I already established that the 400 DO II's image quality is equal to or very close to that of Canon's best lenses, I will not re-visit that topic here. 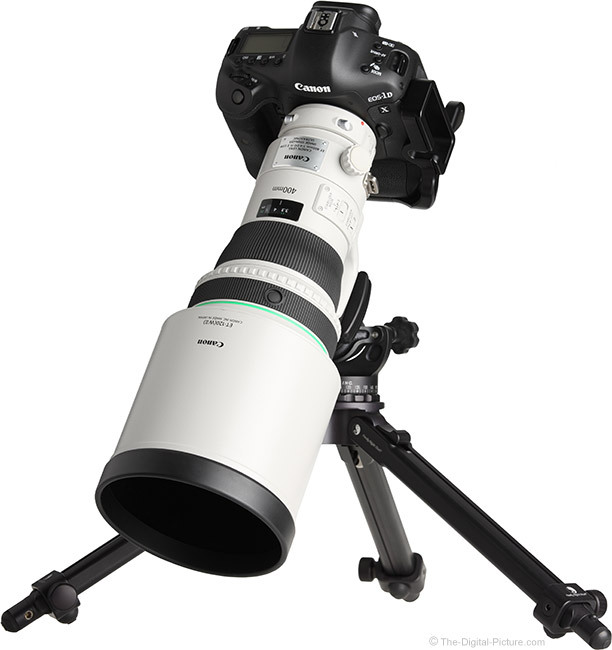 Let's start with Canon's less expensive and smaller 400mm prime Lens, the EF 400mm f/5.6 L. If you do not need IS and an f/5.6 aperture is wide enough for you, this lens will save you a pile of cash along with some diameter and weight. Those two features will surely be missed in many scenarios. The also-recently introduced Canon EF 100-400mm f/4.5-5.6L IS II USM Lens has garnered a great amount of attention (including mine). And for good reasons – this lens delivers very impressive image quality and overall performance. While the zoom lens does not have the f/4 aperture, it has a large zoom range, focuses considerably closer and again, is smaller and lighter than the DO II. 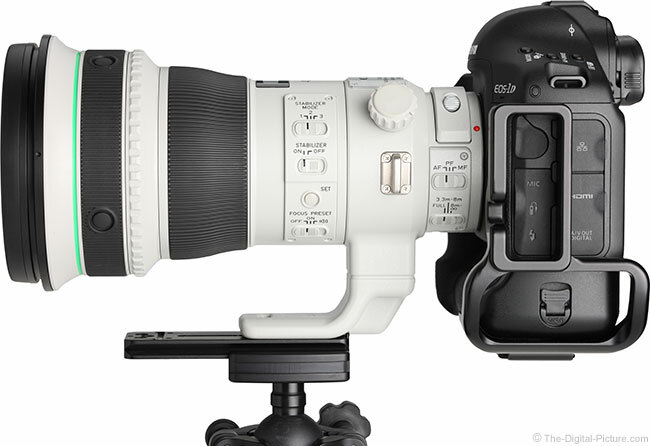 Add a 1.4x extender to the Canon EF 300mm f/2.8L IS II USM Lens and you have a close match to the 400 DO II in many regards. At review time, this combo's cost approaches the 400 DO II's price. The 400 DO II is somewhat smaller and lighter than the bare 300 L IS II and the 1.4x adds both size and weight to that side of the scale. Perhaps the most important decision factor here is the need for the 300mm f/2.8 native option that the 300L IS II offers. If 400mm is the widest focal length you need, the 400 DO is likely the better option for you. 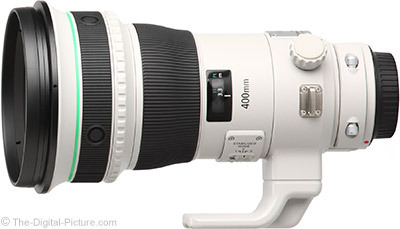 The Canon EF 400mm f/2.8L IS II USM Lens is in another league in terms of size, weight and price. But the f/2.8 aperture it offers also takes its images to another level. The wide f/2.8 aperture allows action to be stopped in 1/2 as much light (same with extenders added) and allows a stronger background blur. If you want to carry your 400mm lens around much (without help from wheels), you probably want the DO version. The Canon EF 200-400mm f/4L IS USM Lens is an incredible lens. This is a lens that I've grown to rely on for many needs with wildlife being at the top of that list. The 400 DO II shares the f/4 max aperture, but the 200-400 has a big focal length range advantage (and a built-in 1.4x extender). Here again, the zoom lens is in another league in terms of size and weight and has a substantially higher price tag. 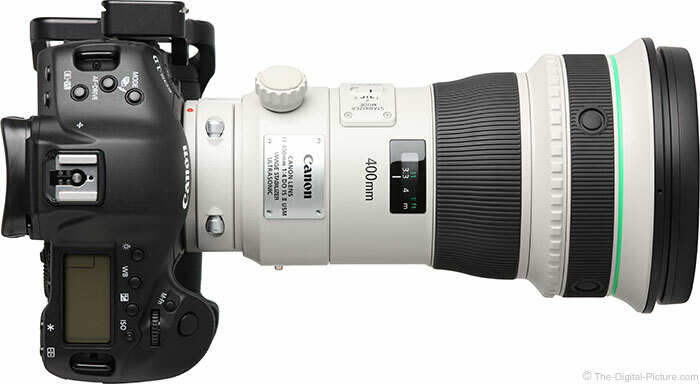 Canon marketing has called the Canon EF 400mm f/4 DO IS II USM Lens "The Portable Super Telephoto Lens". The Canon EF 400mm f/4 DO IS II USM Lens packages impressive image quality in an ultralight and ultra-small package with autofocus and image stabilization systems that are among the best available. The result is, at a price, an easy to take with you lens that is capable of producing world-class images. These features make this lens the ultimate choice for many sports and wildlife photographers, especially for those with higher progression into the aging process. With multiple great 400mm options already in my kit at this time, justifying the addition of this lens to my own kit is still something I need to work out. I can definitely say that acquiring the DO II is a great temptation.